My friend Michelle got a sewing machine for Christmas and last week she brought it to my house one evening for her first sewing lesson. I had a blast! After we finished making skillet handle covers, she was asking about some of the projects I have on the go, so I pulled various things out of my sewing cupboard and we talked about what went into making each of them and what still needs to be done before they'll be finished. I know my enthusiasm for the subject came through in my voice...I love talking about quilting! Actually, I love anything to do with quilting! If you could spend a day with me, seeing what I do and reading my thoughts, you would find quilting is a big part of my day. If I'm not actually working with fabric, I'm planning how to get everything done that has to be done so I can have time to sew, or I'm reading quilting blogs, or checking Instagram to see what other people are sewing, or dreaming up new quilt designs, or thinking about what fabric I want to use for my next project, and on and on it goes. I do these things because I love quilting. I don't read blogs because I feel I have to, or check IG because I worry about what people will think if I skip it for today. I don't set up to sew with a sigh, wishing I didn't have to be doing it. This is what I love and it shows in both my actions and my attitude about it. Whether your passion is for quilting or photography or cooking or gardening or whatever, you probably feel the same way about that activity as I do about quilting. Anyone who asks you questions about your passion had better be prepared for a lengthy, enthusiastic response, right? Thinking about my enthusiastic love for quilting made me think of the verse in Revelation, when Jesus says to the church in Ephesus, "Yet I hold this against you: You have forsaken the love you had at first. Consider how far you have fallen! Repent and do the things you did at first" (Revelation 2:4,5). In the verses preceding this passage, the Ephesian church was commended for their deeds, their hard work and their perseverance (vv. 2,3), and yet Jesus says they have lost the love they had at first. It sounds to me as if they were doing the right things, but they were doing them by rote, or out of a sense of duty, rather than because of love. There was no enthusiasm driving their actions. 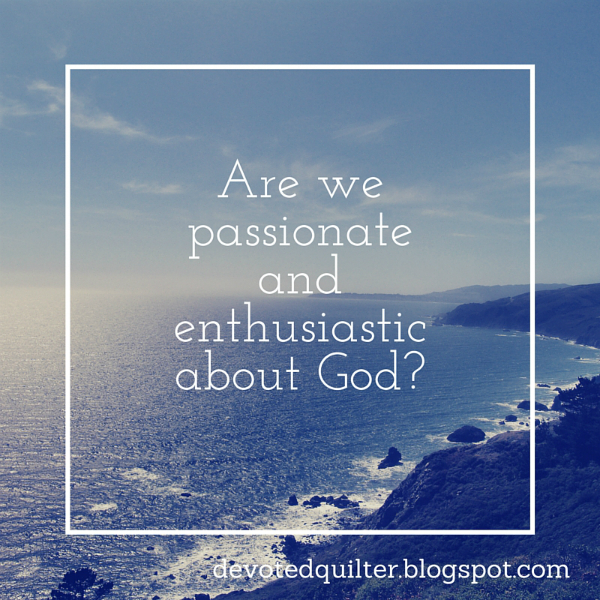 The question for each of us, then, is are we passionate and enthusiastic about God? Do we have that internal drive and desire for the things of God, or are we doing the right things out of a sense of duty and obligation? It's not a question about the things we are doing. The Ephesians were doing the right things, after all. The question looks only at our attitude...at the why for our actions. Are we, like the Ephesians, doing all the right things, but in danger of having Jesus say to us that we have lost the love we used to have?